"Jack Reacher: Never Go Back" is the feminist action movie we really need. No, we don’t get any awkward girl power speeches. Nor is the male hero diminished simply to make his comely co-star look better. The “Jack Reacher” sequel, under producer/star Tom Cruise’s gimlet eye, gives the actor’s co-star all the room she needs. And then some. That elevates a pedestrian mystery above mere sequel territory. In short, bring us more Jack Reacher yarns. Please. Cruise once more is Jack Reacher, an ex-Major who can’t quite escape the military’s orbit. 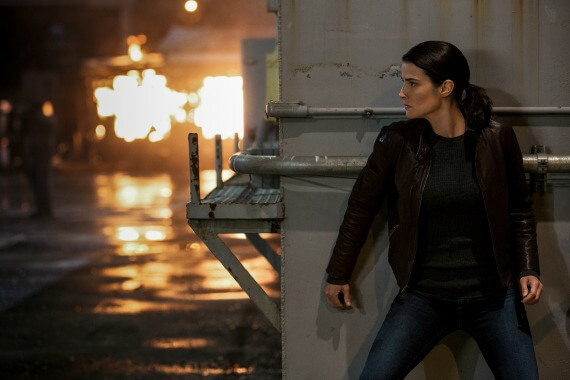 His gentle flirtation with Army Maj. Susan Turner (Cobie Smulders) sours when she’s jailed on espionage charges. Ever the loner, Jack doesn’t want to get involved with the case. His gut tells him she was framed, so he reluctantly investigates. He’s quickly enmeshed in some high-level government chicanery, the kind perfectly suited for the upcoming Clinton 2.0 years. A laconic killer (Patrick Heusinger) is on their trail, a machine who appears to be at least as tough as Reacher. Maybe tougher. Did we mention Reacher might be a daddy, and the teen in question is mixed up in all of this, too? FAST FACT: Lee Child enjoyed a cameo in the 2012 feature “Jack Reacher.” He played a police officer opposite Cruise. He returns for “Never Go Back,” but this time he plays an airport security guard. Director Edward Zwick (“Glory”) juggles the various plot lines better than he does the action sequences. The latter mostly come late in the story line, and it’s clear he’s not the optimum choice for a genre film. The fight sequences lack the dizzying fury of a “Bourne” installment. Nor do they share the distinct snap Joss Whedon delivers in his superhero yarns. Zwick’s care in developing the unlikely triangle between our heroes, however, is first rate. Not only is there sexual tension simmering between Cruise and Smolders, but the odd family that develops between them and their young charge (Danika Yarosh) supercharges the story. The recent “Mission: Impossible – Rogue Nation” also featured a powerhouse female character. Rebecca Ferguson wasn’t eye candy. She was fierce, making the entire adventure better. Cruise simply has the Movie Star Routine down cold. The same holds true for Smulders. She’s a gung-ho military type, and she sees any encroachment on her leadership as a threat. That includes Jack, who isn’t used to delegating authority. She blasts him as sexist. If the charge ended there, it would be little more than another Hollywood lecture distracting us from the industry’s genuine sexism. Instead, the film moves deeper into their conflict. What’s revealed is more satisfying than most action films allow. Author Lee Child’s literary creation remains a blurry proposition for film crowds. This Jack Reacher is a loner who plays by his own rules. We haven’t seen a hero like that in, what, 24 hours? He’s essentially a quieter version of Cruise’s Ethan Hunt from the superior “Mission: Impossible” franchise. In a sense, we’re still getting to know this Jack Reacher. Does it even matter? Cruise has the Action Hero routine down cold. He’s coiled in every scene, which makes his smallest moments hint of possible fury. And when he’s forced to connect with another human being, he looks like he’d rather get punched instead. “Never Go Back” still suffers from some drab sequences. A chase set in New Orleans is so perfunctory it feels like a travel agent shot it. And a critical moment is telegraphed so baldly you’ll be tempted to ask for a free popcorn as compensation. HiT or Miss: “Jack Reacher: Never Go Back” delivers your basic action movie beats with surprising character depth to set it apart from other sequels. It’s refreshing to watch a comedy directed by someone who truly gets what makes us laugh. Greg Mottola of “Superbad” fame isn’t a comedy god. Nor does he sport a resume as impeccable as Judd Apatow’s. He doesn’t even have a comic franchise to call his own. 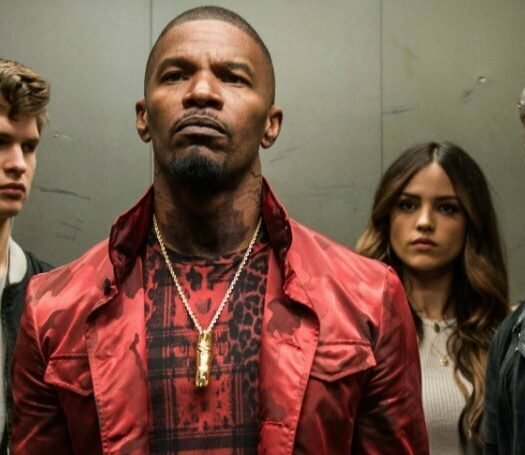 Give him four talented stars and a can’t-miss premise, though, and he delivers. “Keeping Up with the Joneses” might be stretched into a franchise with the right box office nudge. That would be a mistake, since Mottola squeezes everything out of the high-concept story in these brisk 101 minutes. Zach Galifianakis and Isla Fisher star as Jeff and Karen, a perfectly nondescript couple in suburban America. They’re painfully average, but not in a way that smacks of flyover state condescension. So when a ridiculously handsome couple moves in a few houses away they’re understandably curious. That interest spikes when it appears the duo may be hiding something. They aren’t simply jealous of their urbane wit and smashing sartorial choices. The suburbanites’ Spidey Senses are tingling. Tim and Nataline (Jon Hamm and Gal Gadot) aren’t who they appear to be. So Jeff and Karen do some very awkward sleuthing, learning a little about themselves along the way. Mottola makes sure his cast never oversteps its comic authority. Galifianakis can be bore when he pushes his socially awkward shtick too far. Here, he stays in character long enough to make the jokes pop. He has a fine comic chemistry with Fisher, radiating real affection along with an exasperation married couples will recognize all too well. The script offers a bevy of funny lines, including a priceless sequence in an obscure Asian restaurant. “You like Chinese?” Tim asks Jeff. “The Food?” Jeff asks, revealing his cultural insecurity. As much as Galifianakis’ comic persona seems etched in stone, he still can show why he’s still in demand. He plays the sequence flawlessly, his body language revealing his intoxication as much as his slurry speech. 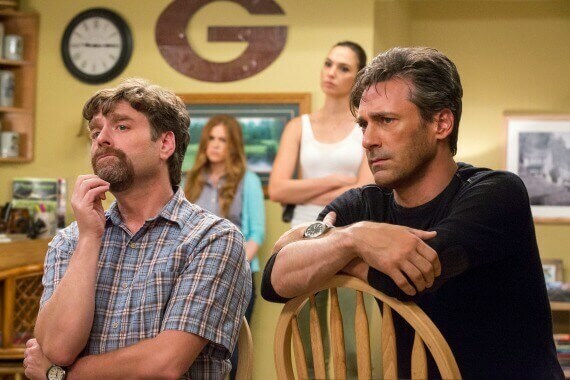 One way “Joneses” surprises is how it treats the allegedly dull couple. Jeff is a straight arrow type, but he’s also a genuinely good listener. Karen may be in a marital rut, but she’s savvy enough to know the score when others might be clueless. In return, Hamm and Gadot reveal chinks in their seemingly perfect exteriors. Watching each couple reveal themselves is one of the film’s true joys. 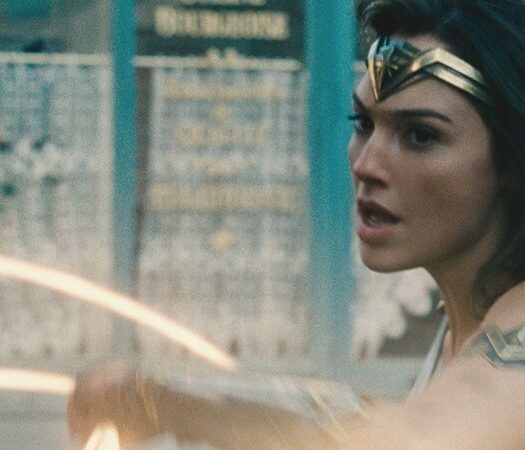 “I may not need to moisturize, but I still have feelings,” Gadot’s character says, showing crisp comic timing. The movie still labors in the third act, a problem many comedies stumble into. The comic action sequences are suitably silly, though, and it’s hard to blame the film for relishing its Bond-esque sequences. HiT or Miss: “Keeping Up with the Joneses” won’t double anyone over with laughter. It’s still a charmer, buoyed by a quartet of capable comic leads.